Seafarer Broadway tickets offer you a glimpse of a very different kind Christmas Eve celebration. In some ways, it's a lot like the famous story A Christmas Carol by Charles Dickens. But it's also very different. 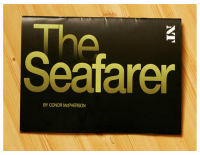 The Seafarer was written by Conor McPherson, an award-winning Irish playwright, is considered to be one of the foremost contemporary writers of the stage today. He won the Laurence Olivier Award for the Best Play in 1999 for his work The Weir. The Seafarer went on to win another Olivier award in 2006. Those with Seafarer Broadway tickets know that it's a highly acclaimed play from one of the best dramatists of our times. There has always been an element of the supernatural in McPherson's work and this play is no different. It deals with a less-than-cheery Christmas Eve setting. Sharkey is a man who is down on luck with a past littered with big and small mistakes. He is in the initial stages of dealing with his alcoholism and is trying to remain clear-headed. He has come to help take care of his brother Richard, who has recently been blinded in a freak accident. Richard is a drinker as well and joining them are two friends Ivan and Nicky. It's Christmas Eve and they hope to play cards to pass time. If you have Seafarer Broadway tickets, you’ll see that this innocent game of cards soon takes a drastic turn. It all starts when a surprise guest, Lockhart comes to join the game. They soon realize that Lockhart is far more than just a mysterious stranger- he seems to be the devil himself and Sharkey finds himself playing for his soul. But it's not just the appearance of the stranger that makes this story so appealing. It's also a tale of regret and repentance. Sharkey may start out sober but we see that he's a broken man, imbued with a strange sense of grace. His brother Richard seems cheerful and jovial on the outside but his resentment boils just beneath the surface. Theater-goers who are familiar with McPherson's work will notice one big difference in this play in comparison to his earlier work. His earlier pieces were marked by their unique use of dialogue- McPherson's characters rarely spoke to each other. Instead they would often have paragraph-thick monologues that they would utter from time to time. In this play, there is a definite interaction between the characters on a conversational level and some have compared the dialogues to the work of Mamet. The play is also an expert blend of the comic and the tragic- one can't help but chuckle at the characters as they suffer from their hangovers and short-term memory loss. The play never stumbles into the overtly melodramatic or the slapstick- it maintains a tight balance between the funny and the sad. The play is ultimately a richly layered piece that is both thought provoking and satisfying. Rather than battle the ticket counter crowds for your theater passes, you can order your Seafarer Broadway tickets with an authorized online ticket vendor, online. To view a great online selection of Seafarer Broadway tickets click the link!